Stay safe! Hinge back with the hips and never round your spine. When first diagnosed with bone loss, people often want to jump into a bone-strengthening exercise program, ASAP! While it’s a good idea to pursue weight bearing and muscle strengthening exercise, it’s even more important to find the ways you might already be putting your spine at risk during your day to day life. I’m often asked, what is the most important exercise for healthy bones? My answer is first and foremost, always keep good body alignment in all your daily movements. Standing tall will help develop your posture muscles. What is good body alignment? • Anything that requires you to reach far. An example is reaching up for an item on a high shelf, which also could cause you to lose your balance and fall. • Some exercises can do more harm than good. If you have osteoporosis or have had broken bones in the spine, you should avoid exercises that involve bending over from the waist. 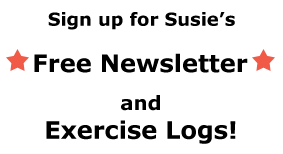 —From NOF’s “Proper Body Alignment” article. Fixing your body alignment will take some detective work as you go through your day. From tying your shoes to getting a file from a lower drawer or putting heavy bags into your car, you’ll find several times a day when your spine is at risk because of a forward bend. The precautions above are recommended whether you are in the low bone density range or have been diagnosed with osteoporosis. The reason we don’t want to bend forward and put more pressure on the front part of our spine is because it’s weaker than the back part. Keeping a neutral spine with the pressure off the front side is one way to significantly reduce your risk of fracture. Developing the muscle memory of consistently keeping good body alignment with a neutral spine is worth the effort! As the years go by, our risk of fracture increases and this muscle memory will help you automatically move safely. A neutral spine is your most upright, elongated, best posture. You can think of it as keeping a flat, not rounded back. But there are still the normal curves of the spine which look a bit different on all of us–in a little below the head, out a little at the upper back, in a little at the waist, and out a bit at the lower back. Touch the back of your head, shoulder blades, and tailbone against the wall. Your feet don’t need to be all the way against the wall because we all have different derriere sizes! Don’t strain if your head doesn’t touch the wall, but stand as elongated and tall as possible with your chin level to the floor. Now, walk away from the wall and come back to see if you’ve held the position. Most people feel like robots at first because they’re not used to being so upright. Also, by the time they’ve walked around for 30 seconds, they’ve begun to slouch again. Do this wall posture check numerous times a day to build the habit of great posture. If your back muscles get tired while sitting upright, use pillows behind your back for support while you’re building good posture. If you stick with it, you’ll be rewarded with stronger back muscles and beautiful posture. Instead of rounding over when you need to lower down, do the “hip hinge.” This is definitely a move that requires you to stick your buttocks back and takes time and practice to learn. It’s reversing the rule most women learned decades ago, to “Sit like a lady!,” which causes us to tuck our hips under, letting our knees go forward, and rounding our backs. A good test to see if you’re rounding your back is to put a dowel or broomstick at the back of your head, upper back, and tailbone. Then, hinge back with your hips as you lower down, keeping your chest up, knees behind the toes, and the dowel in contact with those points. When it begins to lift off any point, you’re beginning to round. With kyphosis, you might not be able to touch all three points when upright, but simply use the dowel as a reference for your most upright posture. Requesting a referral from your healthcare provider to a physical therapist (PT) is an ideal way to learn these moves. The one-on-one instruction a PT provides can get you off to an excellent start. If you’ve received a bone loss diagnosis, moving with a neutral spine from the moment you leave your doctor’s office will help avoid fractures. It may feel awkward at first, but moving like this will also help protect your intervertebral discs, the soft cushions between the vertebrae. Once you have these bone-safe movement patterns established; then look into taking that bone-strengthening exercise class! But call ahead to make sure that it’s adapted to be bone-safe. Move safely and do no harm! Do you have any tips that help you move safely to protect your bones? Let us know in the comment section below. Note: This blog post was first published on the National Osteoporosis Foundation’s blog, Bone Buzz. If one’s bone numbers return to the osopenia range, is it still necessary to be so careful? Can one look forward to taking a regular yoga class again, for example? Ethyl Siris, MD, a former president of the National Osteoporosis Foundation, brought this up at the NOF’s 2013 International Symposium on Osteoporosis and said that the precautions for osteoporosis and low bone density or osteopenia are the same. The WebMD link where I found the following quote has now been changed, but below is her quote that used to be in the article. Great tips. I have been practicing the sitting exercise to be able to reach the floor without bending over from the waist. It’s hard but I’m getting the hang of it. Your thighs scream at first but after a week, they feel stronger. My lower back is the most painful at this point. My trainer emphasized to keep the knees behind the toes. Melody, that’s good advice to keep your knees behind your toes. Careful of your lower back. If any exercise hurts, have your trainer show you another way to do it. Working hard is good, straining isn’t! 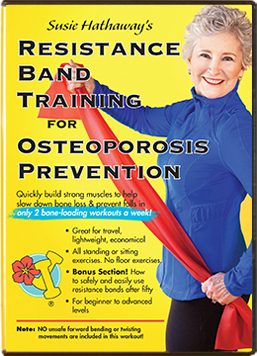 I would like to ask if you think it is important to seek out a trainer or PT with a specialized knowledge of osteoporosis or whether any competent, conscientious trainer could be shown Susie’s program and help check the postures. Good question and I would have to say, everyone starts somewhere and it would be great to introduce a competent, conscientious trainer to bone-safe exercise. Believe me, though, it’s a process to find all of the ways one might be moving with a bent spine. Habits of a lifetime! 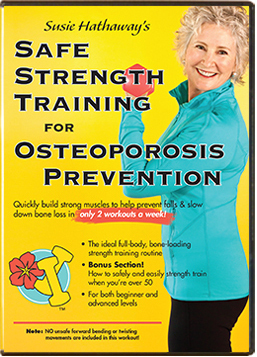 I’d suggest the trainer also review information from the National Osteoporosis Foundation at NOF.org. It’s not only a matter of moving with a neutral spine, but acknowledging that some people might need to forgo lifting heavy weights, especially if they’ve already had a fracture. There are many exercises that can strengthen the spine and back without putting the vertebrae at risk. A person with fragile bones might not be able to do impact moves or dead lifts, but other weight bearing cardio activities and back extensions can also be effective and safer. Trainers would also need to be careful not to use exercises that put too much downward or upward pressure on the spine, like a heel lift machine that has resistance pressing down on the shoulders. I’m a 50 year-old woman and I have just been diagnosed with osteopenia after a dexa scan that was prompted by a stress fracture of my large toe. I’m a triathlete, always been active, and looking to run again after I recover. My doctor says that should be no problem but I’ve been reading that running and hiking should be avoided – https://ageless-nutrition.com/staying-active-with-osteoporosis/ Is this because of new findings or what? There are no new findings that I know of. The National Osteoporosis Foundation (NOF) gives guidelines for patients and doctors. Running is one of those gray areas in terms of whether it’s safe or not to do with osteoporosis. You’ve been diagnosed with low bone density (osteopenia), not osteoporosis, but you’ve had a stress fracture. Did your doctor consider it a fragility fracture? If so, a doctor will usually recommend low-impact exercise. Whether running is safe depends on the individual. On one hand, some impact is good for bones, but it’s an individual matter of how much impact is too much and is why checking with your healthcare provider is recommended. If you haven’t had a fracture, the Too Fit to Fracture guidelines (see below) state that you can work in a moderate to vigorous-intensity with aerobic activities. But, they don’t specify how much impact is appropriate. If you run, make sure that you put attention on being stable so that your fall risk doesn’t increase. Below are two discussion threads about running on the National Osteoporosis Foundation (NOF) Online Support Community site with members giving their experiences of running that you might find helpful. Lots of community members’ opinions, but no solid medical advice. Both discussions are closed, but you could start a new one if you’d like to hear from other runners. You could also search Running in the upper right search box. As a triathlete, you’re accustomed to lots of exercise, more than the amounts below, but I thought to add this simply for the intensity recommendations. “Vigorous” intensity isn’t mentioned for those who’ve had a spinal fracture. Exercise research is ongoing to determine the best exercise prescription for those with bone loss. In the meantime, take the information that’s currently available and determine, with the advice of your bone health team—healthcare provider and physical therapist—the best plan of action. Sorry….Following on from my earlier message I forgot to mention that I was also diagnosed with slight scoliosis of the spine about 4 years ago. Thanks for your question and I’m sorry to be so late getting back with you! With scoliosis, it’s best to get your healthcare provider or physical therapist’s advice on how to adapt your exercises because it’s an individual issue. With that said, there are numerous women in my classes with scoliosis who first worked with physical therapists.